A bit more wisdom from Mother Teresa for Sunday Thoughts. I was thinking about the daily things we all do at home this morning. This little sentence just convicted me. 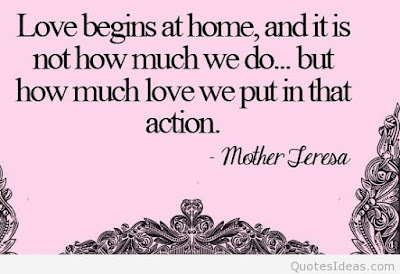 How different would our homes and our world be if we put love into everything we do? It's not always a popular thought today. 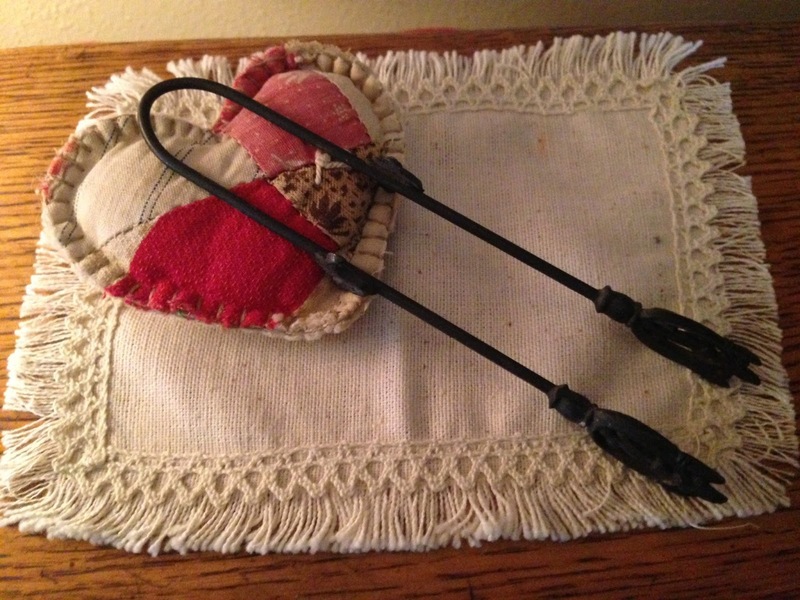 I know I don't always have a cheerful heart when I am cleaning up or doing those everyday chores that are never ending. We welcome a new month tomorrow-the month of Valentines and love, so I a going to work on my attitude this week. I hope you have a good one. 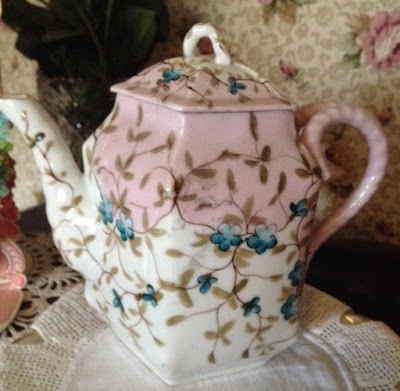 I can't believe that I have done 99 Tea Time Thursday posts! 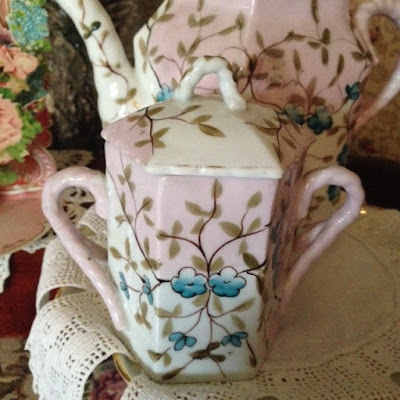 It's so much fun to post about tea and tea time related items. I do love it. I have taken a few breaks here and there, but I think 99 in a pretty big number. 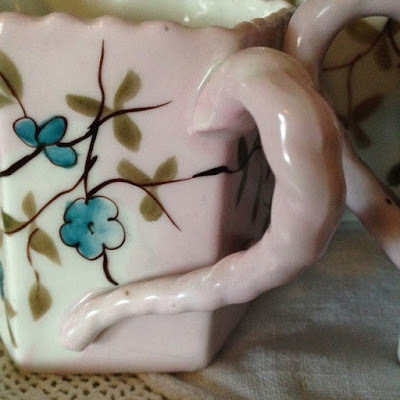 I wanted to post this little set on my Tuesday Treasures, but wanted to save it for today. I recently found this at an antique show and of course, just fell in love with it. There are no marking on it. 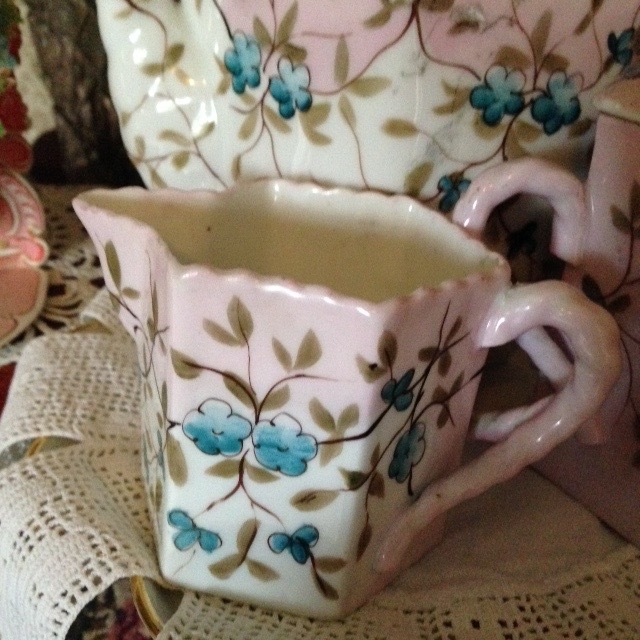 I love the delicate colors and isn't it funny that it also has a twisted handle, like my transferware jugs. 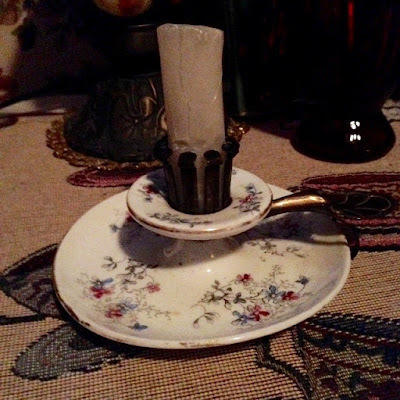 It almost has a lusterware look. 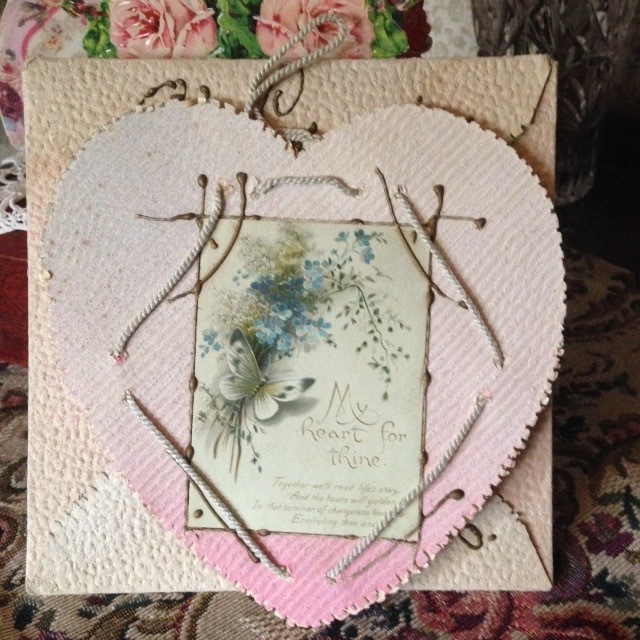 It's very delicate and just screams spring....or at least Valentines. 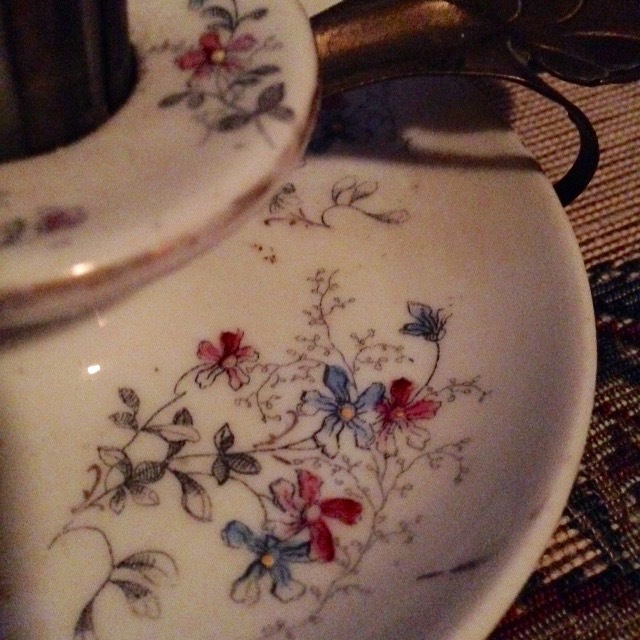 The teapot is four sided...a bit different. 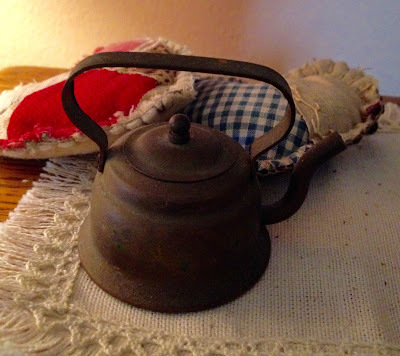 It's probably a 4 cup teapot. 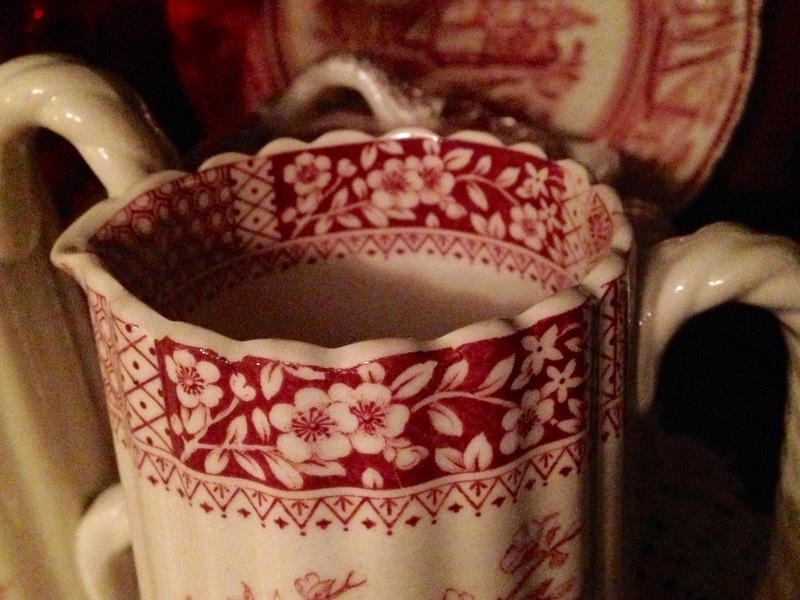 Such a sweet little creamer. Don't you love the scalloped edging around the top? 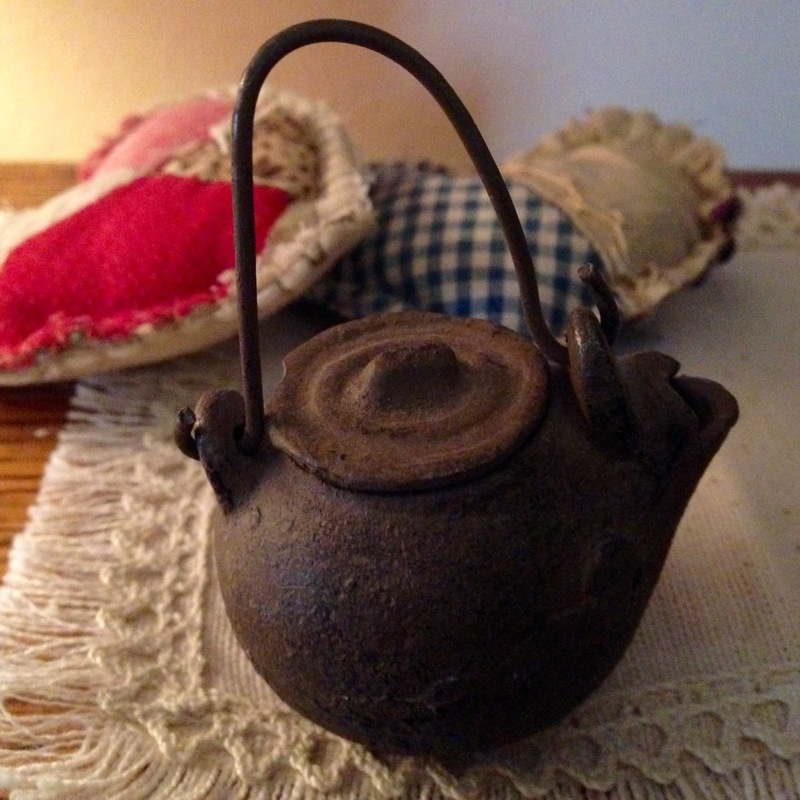 The covered sugar bowl has the same shape as the teapot. It quite heavy with the handles. January is all most over! We had some nice weather earlier this week but the rains decided to make a return appearance. My goodness, it was just pouring again. 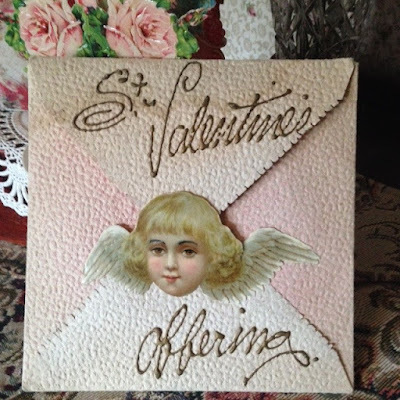 I decided it was time to start adding some Valentine things in my blog, as the lovable holiday will soon be here. I love vintage Valentines. I have had this vintage Valentine for years. The envelope is made of a heavy paper. 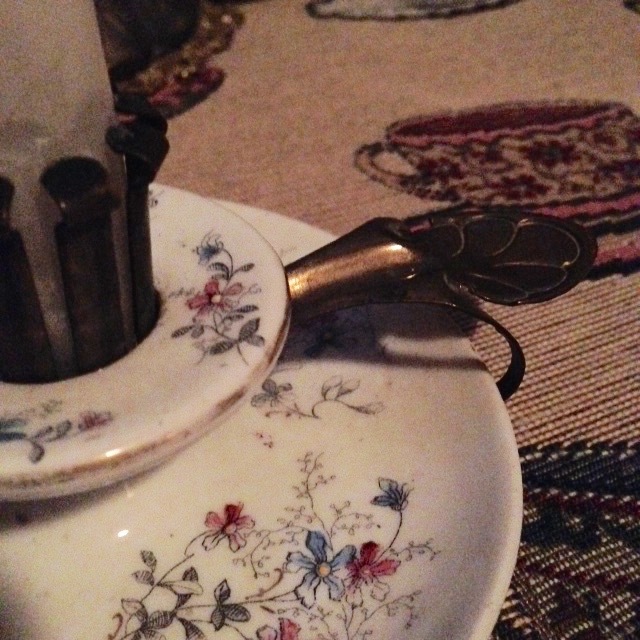 It is a bit fragile, so I don't open it too often. This heart lives inside and has twine to hang it up if you wish. 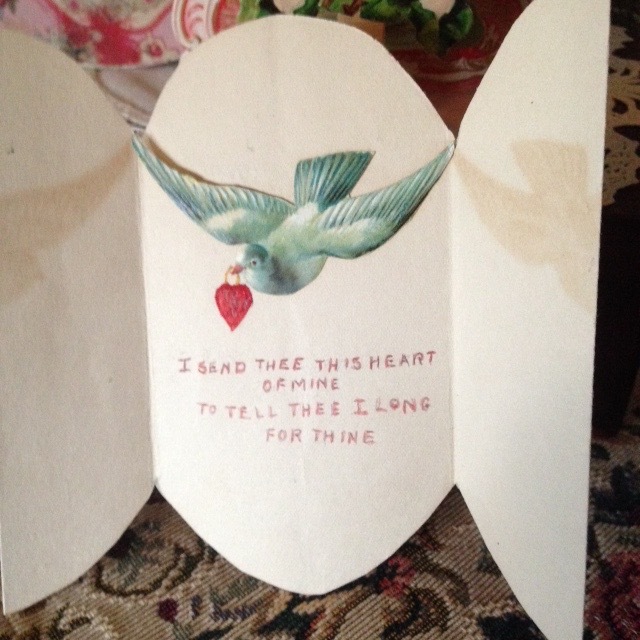 This sweet card is handmade and just charming. 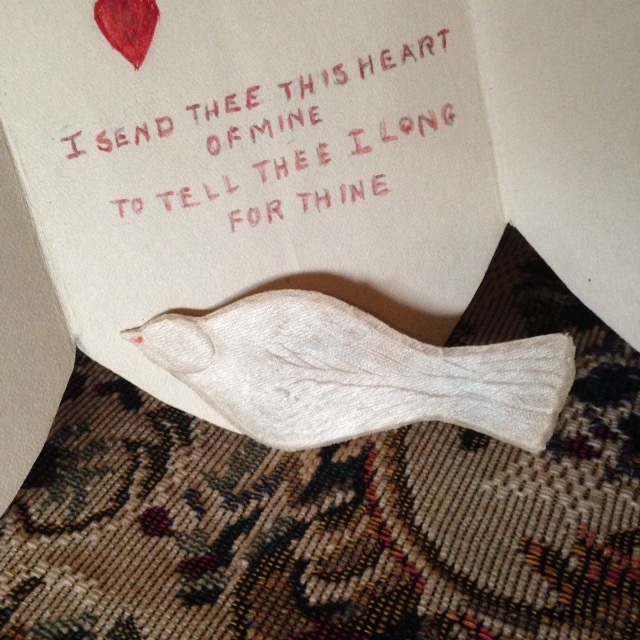 I love the message and the little birds inside. This card is really nice. 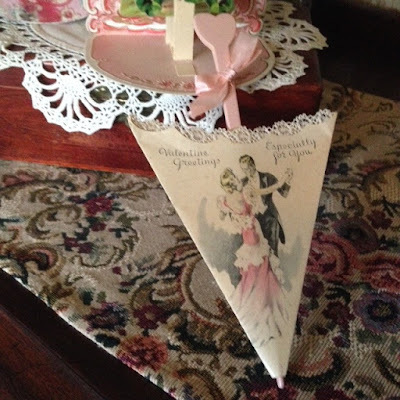 It has a wooden pink heart on a stick so it looks like a parasol. It's just sweet and pretty. 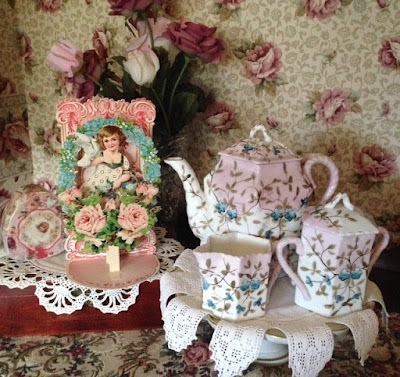 I hope you enjoyed Tea Time Thursday. Think hearts and flowers and pretties! 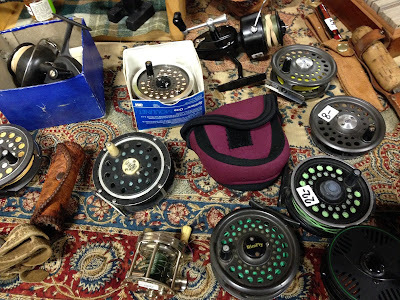 Tuesday evening and still a bit of time to post my finds from this past weekend. I spent the afternoon OUTSIDE, cleaning up my front flower beds. It felt so good to be outside in the fresh air. The rains backed off and it was quite warm for January....47 degrees! As I watched the nightly news, I wondered what my friends, who are still buried under tons of snow, would think of me outside working in my yard! This is a sweet vintage porcelain candle stick holder with a metal parts. It is German, but I don't know the company. It is marked GES GESCH. That actually stands for Gesetzilch Geschutzt which means legally protected. The marks were used after 1899. 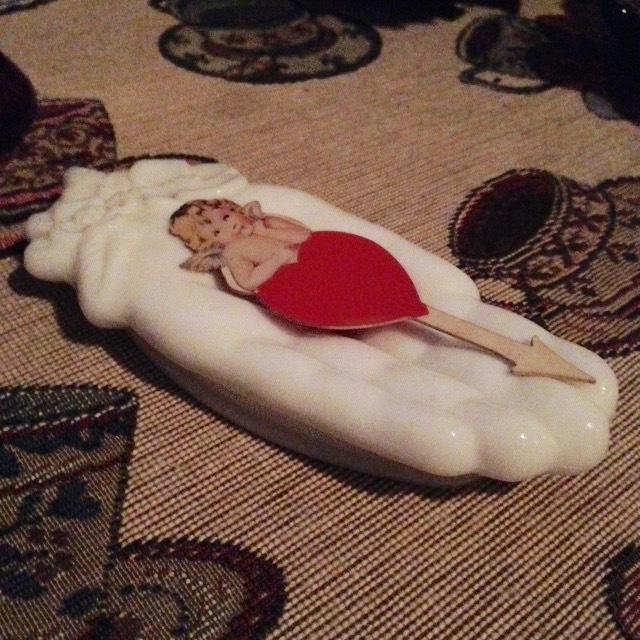 I really can't find much information about this sweet piece. It has been used and is missing some of it's gold trim, but I still really like it. I like the metal candle holder and the metal handle. It just makes it a bit different from the others I have seen. It is now living in my tea room and looks quite comfy there. 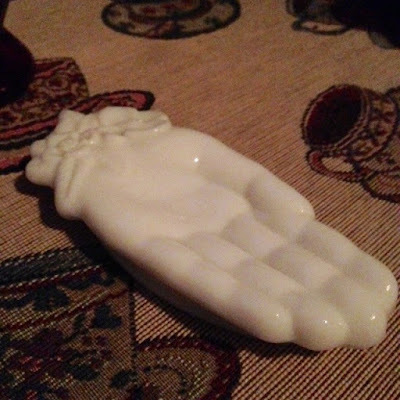 I also found this little milk glass hand. 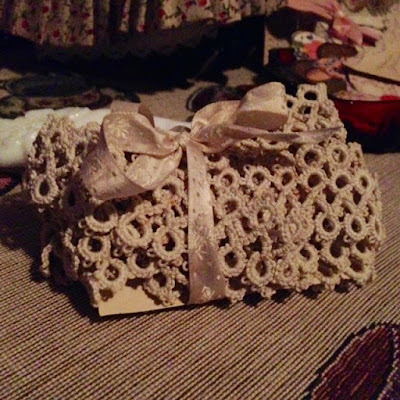 It was made by Avon and is small. I have been looking for one for awhile. I wanted the "hand" to hold a little paper Valentine that I have had for awhile. Perfect! 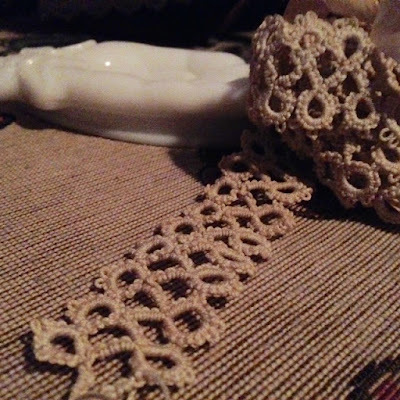 I adore old lace and tatting. Isn't this a wonderful piece of vintage tatting? There are 3 yards of this! I have never found a piece of double tatting. So pretty. I would like to learn how to tat, but I am not very good at this type of craft. My hubby actually found this book...it is wonderful. 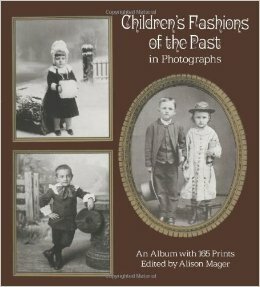 It is filled with 165 photos, all of children from 1860-1920. The pictures are not individually dated but each country is identified. Some photos are from Europe and some are fro America. It's fun to study the clothing as well as the children. They just look like little adults! I am linking up with BERNIDEENS blog party. Hop on over and see what's going on with her blogger friends. 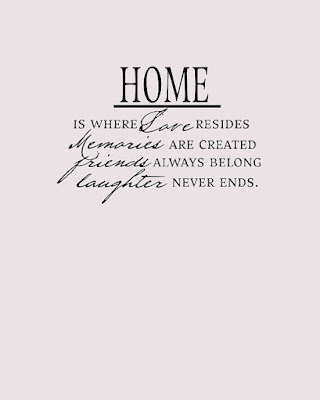 Simple thoughts this Sunday morning about HOME. I am thankful for my cozy little home today. I had hopes and dreams of a big home, but it was never meant to be. 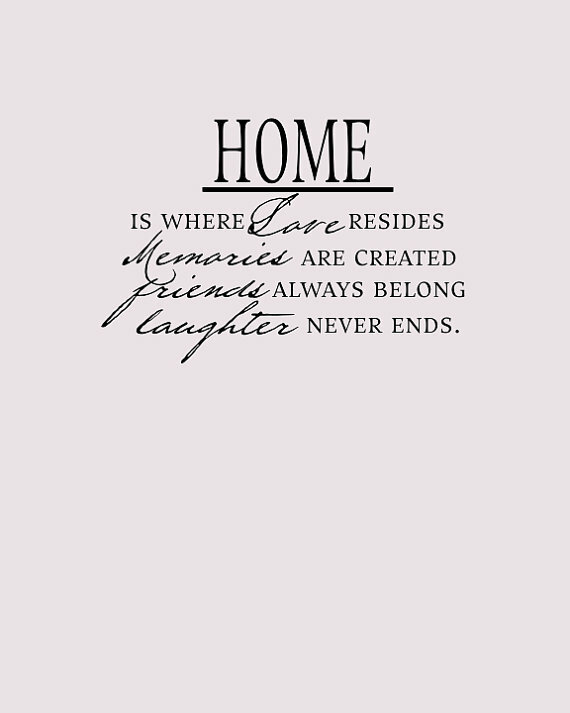 Our house is small, but our home is large on LOVE. Our daughters still like to come home! Jim and I have tried to make it a place to escape from the crazy outside world. It is peaceful here and I need that and offer that to others. A blogger friend in Washington state lost her home and everything in a fire the other night. My heart just aches for her and her family. That will put your heart in the right place! Be thankful for the home God has granted you, take good care of it and open it's doors to those who need a bit of rest and renewal. 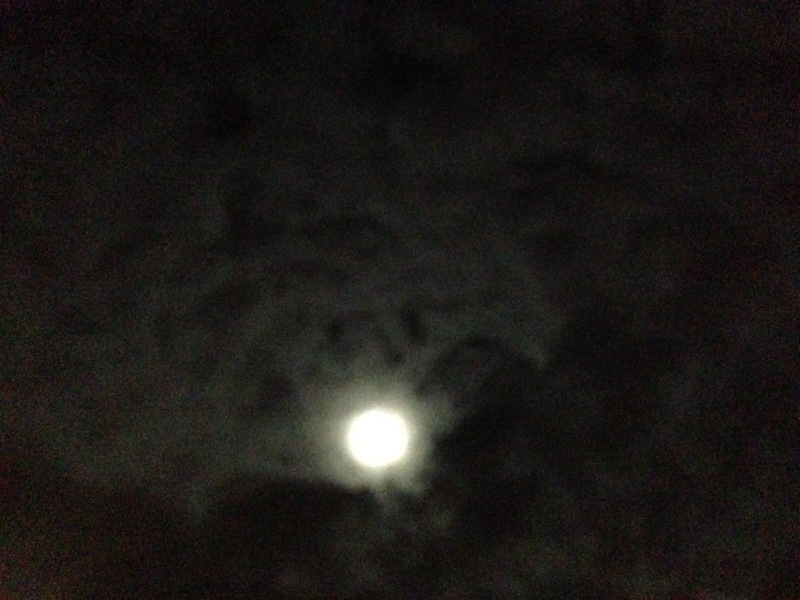 Full moon tonight! I was able to snap this photo last night as I knew it would be raining tonight. You can see the clouds moving across the winter sky. 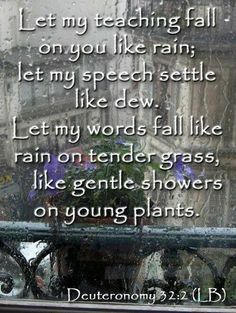 Our weather has turned warm and wet once again. I know many of my blogger friends are under a blanket of snow tonight. The names of the moon are many this month...most of them do sound like winter. Wolf,winter, cold, stay inside, big cold, whirling winds, freezing, ice, old, cooking and quiet. My choice this January is QUIET! Oh, how I love quiet! I think that's way I really like winter. 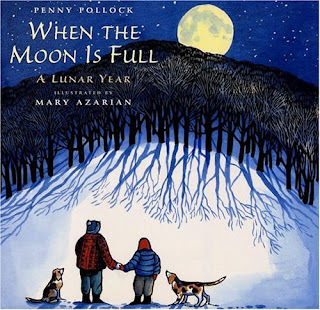 This is a wonderful children's book about the full moon. I need to order this to share with the grandchildren. We had a nice surprise tonight. Our daughter Gina showed up at our door this afternoon! An unexpected visitor from Seattle. She came down for her friend's birthday. Always a treat to have her with us. It's been a busy day but I still want to post my story for Tea Time Thursday before the clock strikes midnight! The new fridge was delivered today so we are thankful! It was a smooth delivery, but a lot of work! What a way to get you fridge all cleaned out-LOL! I wanted to share this small little cast iron tea kettle. 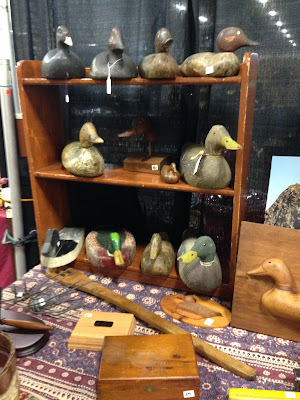 We had it for sale at our show and I was SO HOPING it wouldn't sell, as I really wanted to keep it. It's so sweet and it's small. 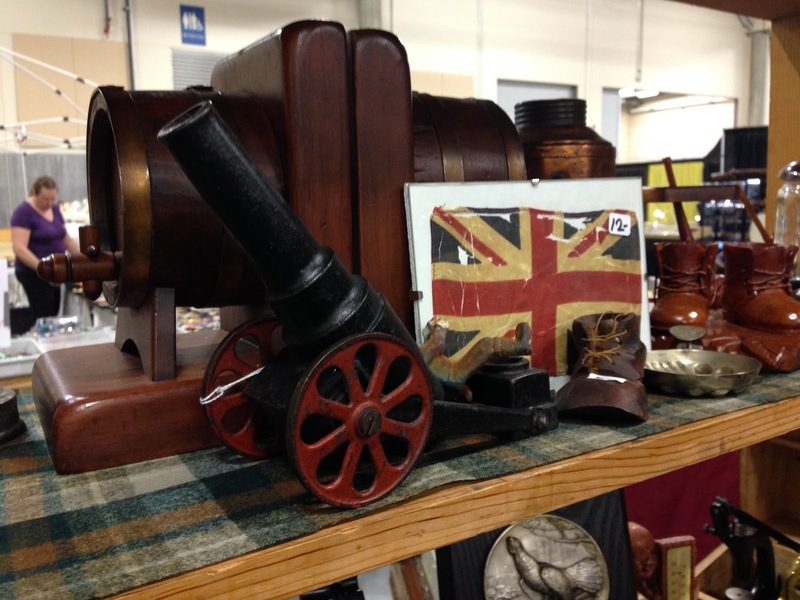 It's made of cast iron and is in good condition. 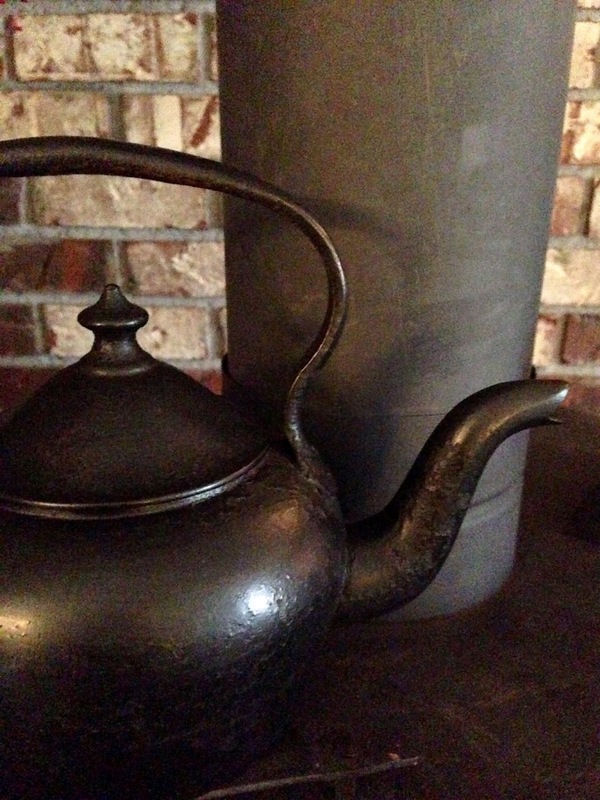 A tea kettle is used to boil water for tea. The water goes from the tea kettle to the tea pot! I am not going to use this for making tea...it will have the honor of gracing our wood stove and just be charming. 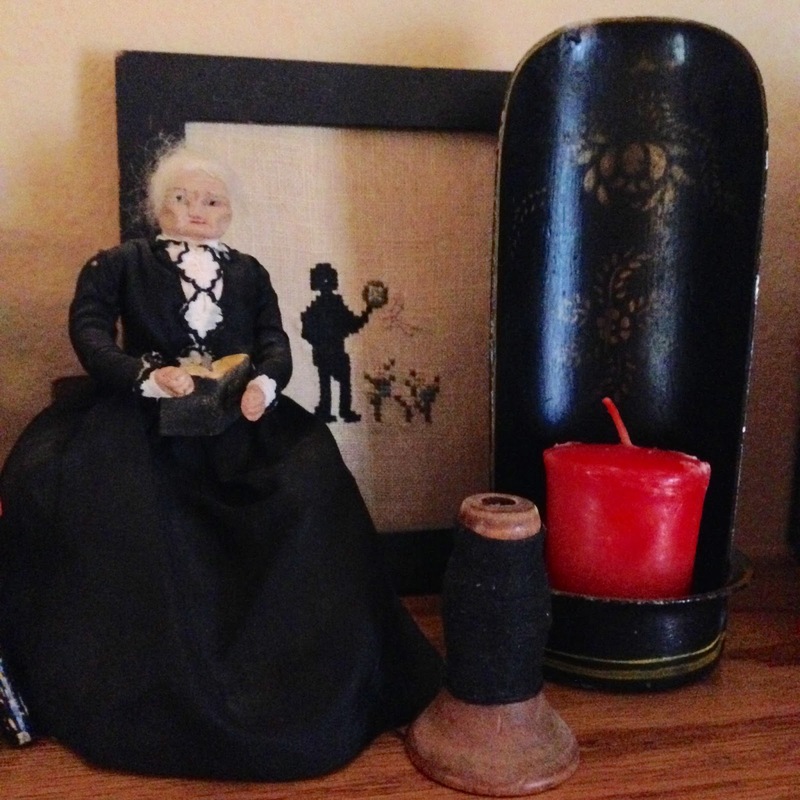 As I love doll and miniature things, of course, I have collected a couple sweet doll kettles. 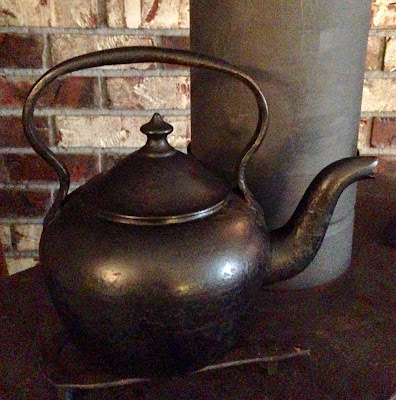 This one is quite heavy and is also made of cast iron and the top opens. This one is quite charming too. It's made of tin.and the top comes off too. It is a favorite of mine. 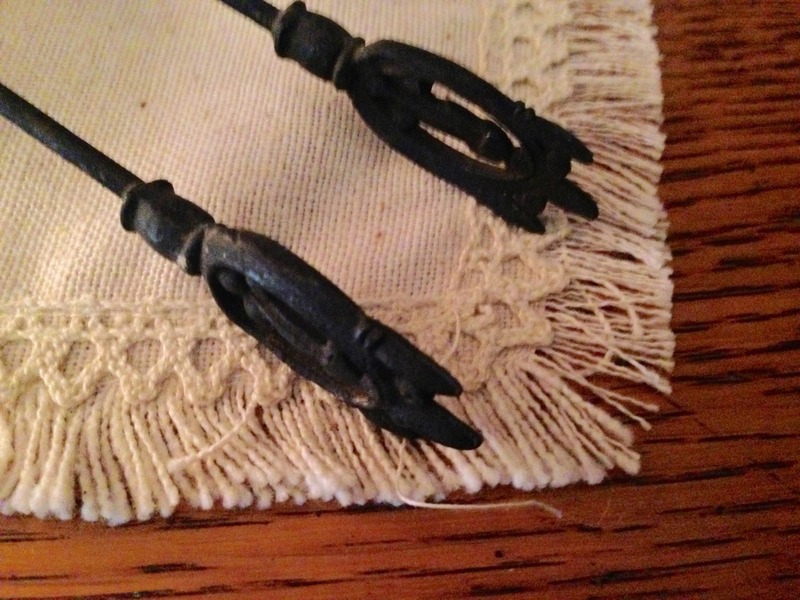 I also got to keep these vintage sugar tongs. They just fascinate me. They just have a special look. 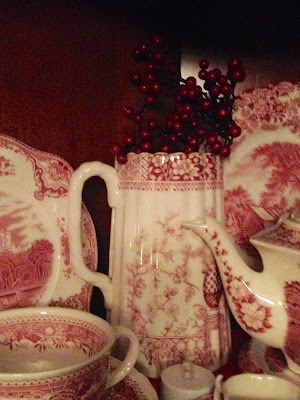 Thursdays are a special day on my Tasha Tudor group. We call it Dolly Time and it has become a day that I really look forward to! So, you might be seeing some dolly stories on Tea Time Thursday now. This little doll is a little old lady who just looks very wise and as my friend LaVonne said, she probably has some yarns to spin. I named her Hannah. 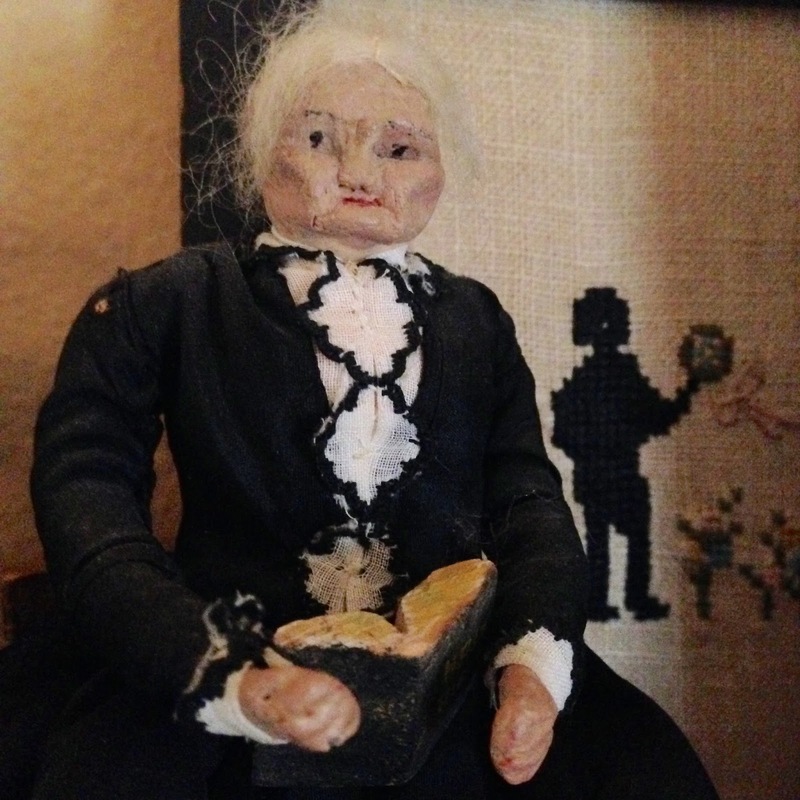 Her face seems to be made of clay and she has white wool hair . Her dress is made of silk. Hannah has stocking legs and little fabric shoes. 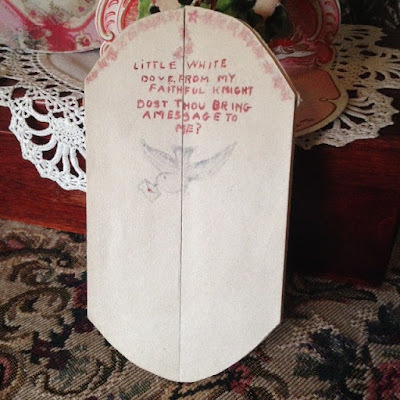 Her book is a carved wooden Holy Bible. 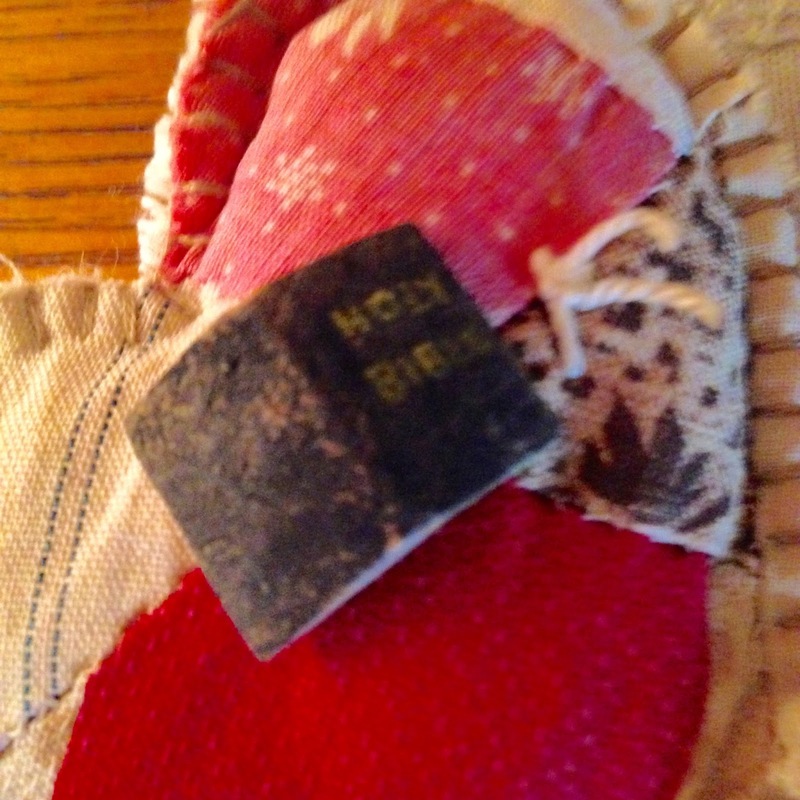 It looks well worn and I'm sure Hannah know a verse or two. 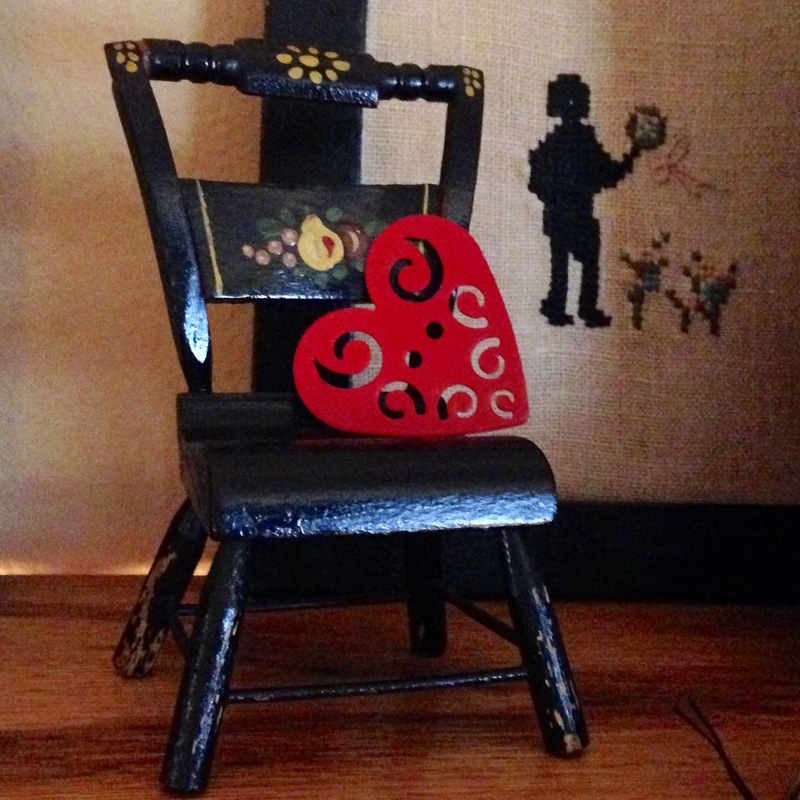 She sits on a different chair, but this sweet dolly chair was a great find in Vermont on our summer trip. If it wasn't so late, I would be putting a kettle on for a nice cup of tea! 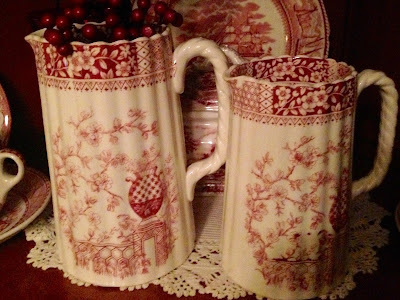 Tuesday Treasure ~ Transferware Find! Today, I'd like to share with you two lovely pitchers or as the English say, two jugs. I recently found them at a flea market and I do believe, they go quite well with my growing collection. They are really lovely. They are not marked, but the seller thought they were made in England. I wasn't really sure how transferware was made. 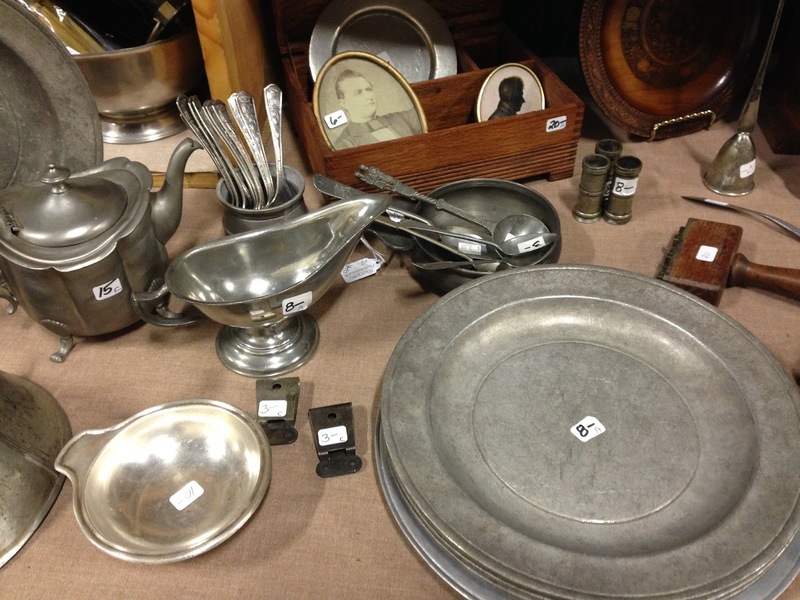 The designs are etched on a copper plate and printed onto paper. The paper is applied to the clay item, peeled off and then glazed and fired. The design transfers off the paper onto the clay. 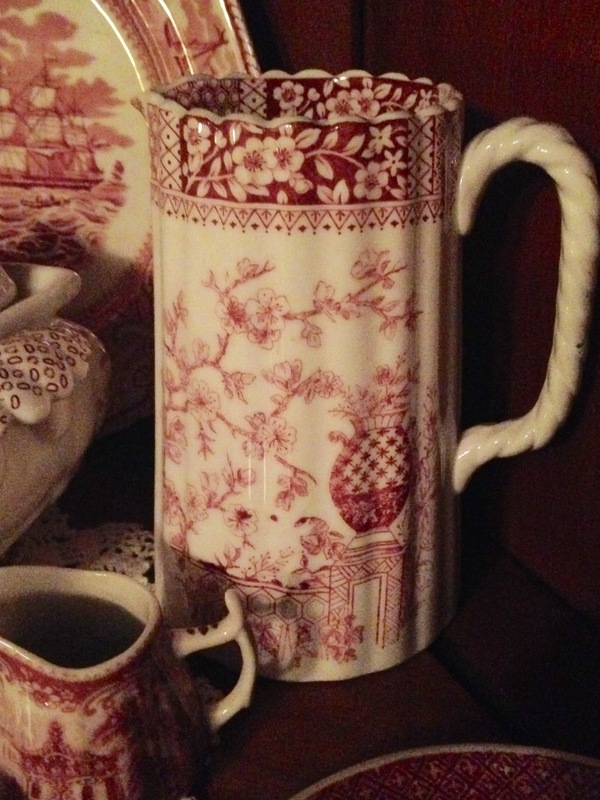 Transferware comes in many colors and can also be found in multicolor patterns. I collect brown transferware, blue, pink and several Johnson Brother's patterns that are multicolored. It all blends quite well, don't you think? The pair are exactly the same, just a little different in size. It makes me happy to see the floral band that goes around the outside and the inside of each pitcher. I love the design. 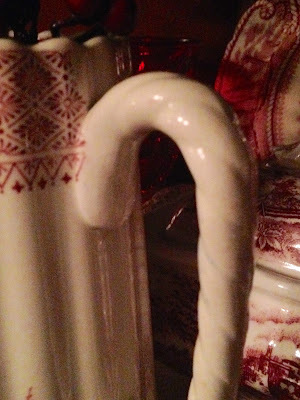 The handles look like a piece of twisted rope. 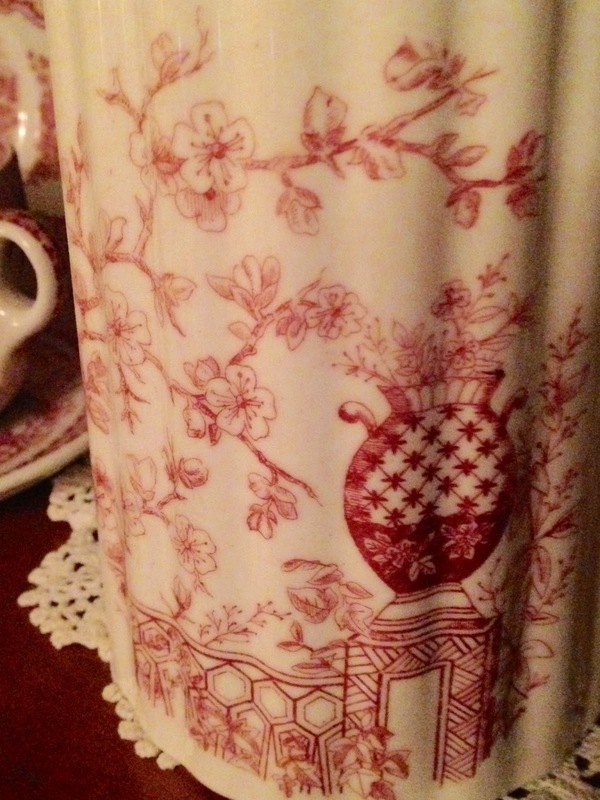 Here is a closer look at the delicate flowers that decorate the pitcher. It looks like a fence surrounds the bottom of the pitcher. There seems to be a gate with a large vase filled with flowers. I hope you enjoyed my special finds today. 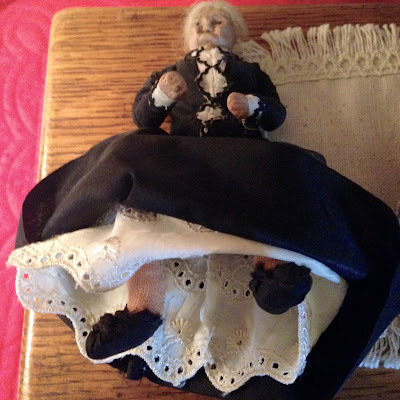 Remember to visit my friend BERNIDEEN at her blog. She does a very fun blog party on Monday and you can visit several creative bloggers. She posts on Mondays, but I pop over after my post on Tuesdays. I have been thinking that the things in the refrigerator just didn't seem real cold. I tried turning it up but it just wasn't getting any colder. We replaced our old avocado one before Jimmy retired...it had been so faithful for 30 years! Sadly, it's replacement only lasted 6 years! So, we went to Lowe's today and picked out a new one. It's a good thing Jimmy had a great show...lol. 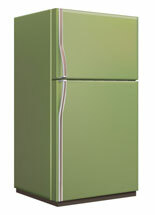 You sure don't have much to choose from if you want a white appliance. Nothing fancy, just a basic fridge! It will be delivered on Thursday...yeah. It's winter in Oregon and that means lots of rain. I love the gentleness of this verse. This week I am going to let God's words pour over me and just let them soak in. 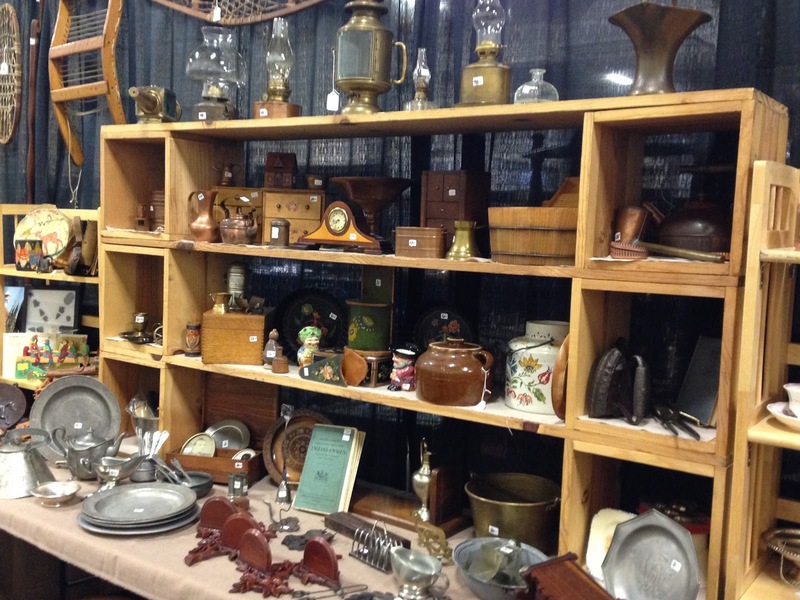 Clark County Show and More Smashed Pennies! 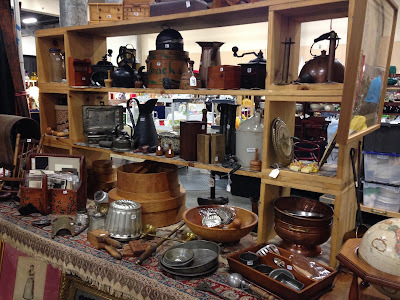 Yesterday was set up day and early bird buying at the Clark County Antique and Collectible show in WA. It's about a 45 minute drive across the Columbia River from Oregon to Washington. We do this show there once a year, in January. 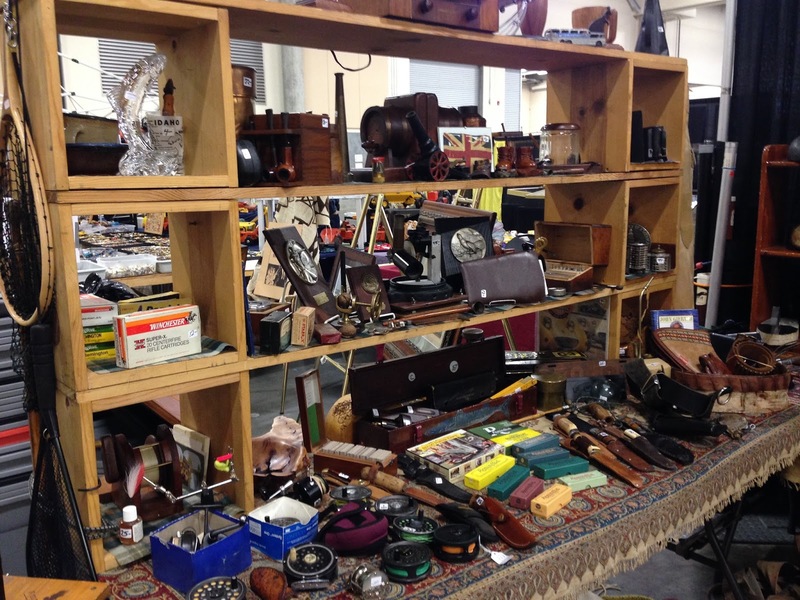 It's a bit smaller than the Expo show but it is one of our best selling shows. The people are really nice and fun at this show. Jimmy is looking pretty happy at the end of the day. I do his displays for him and it's fun for this old retail shoppe owner. We had retails stores most of our married lives...pharmacies and gift shoppes. This retirement hobby is fun for us both. Enjoy some photos of our booth. 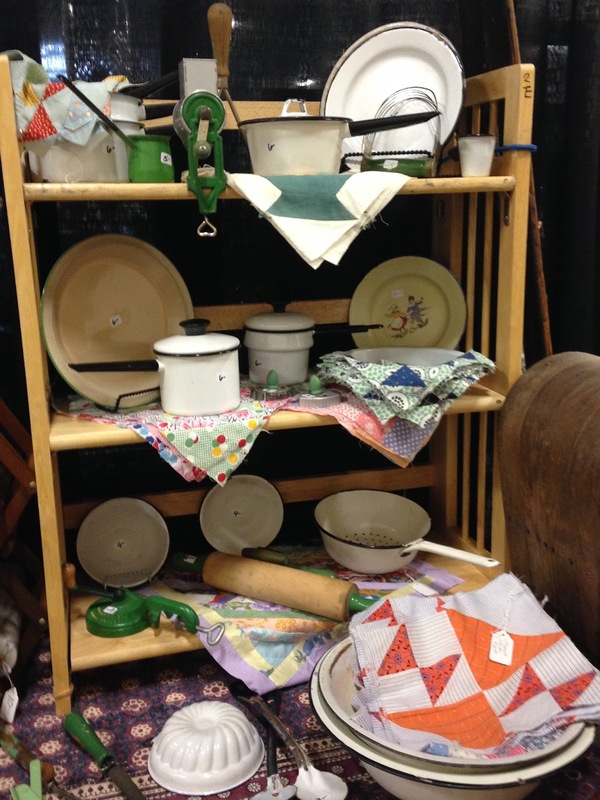 Unfortunately, I didn't snap pictures until the end of the day, so a lot of our goodies are missing from the photos....but then, I am not complaining. I am thankful for such a wonderful day of sales! You get to know a lot of people in the trade. 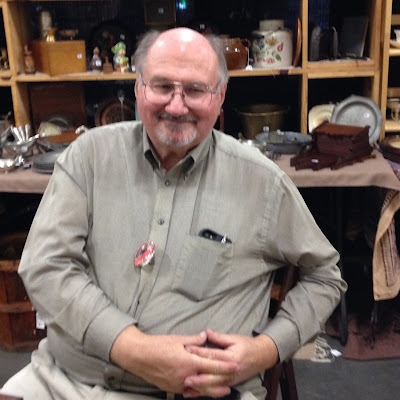 There's a man who does Estate sales and the shows who knows I collect smashed pennies. He brings me pennies at each show...isn't that nice? I got 3 yesterday. I did a blog post earlier on my collection, but wanted to share a bit more about the pennies. According to Wikipedia, this is the definition of these pennies which are also called elongated pennies. 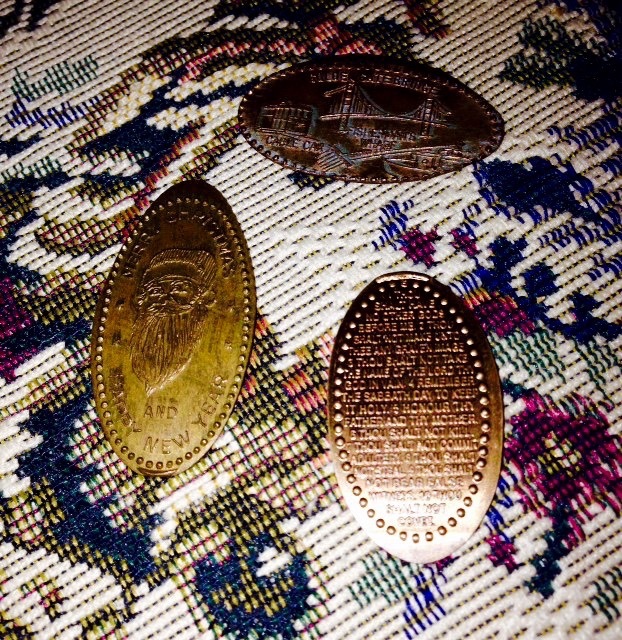 "Elongated coins are coins that have been elongated (flattened ore stretched) and embossed with a new design with the purpose of creating a commemorative or souvenir token. The collecting of elongated coins is a branch of numismatics. Elongated coins are categorized as exonumia." This is my very first smashed penny that was given to me by my Uncle Rich when I was just a girl. I always loved it and saved it. It's the Lord's Prayer. 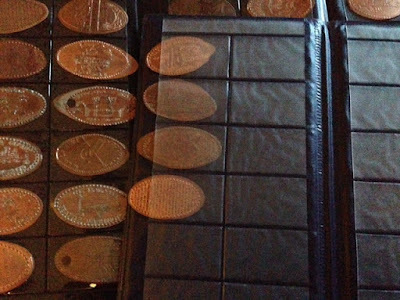 This is my Penny Passport~the keeper of my collection. I have started a second book now. It's a great way to keep these together and enjoy them. My granddaughter Ava likes them too, so I got her a book. These are the new ones I received yesterday...the Golden Gate Bridge, A Merry Christmas and Happy New Year, featuring Santa, and the 10 Commandments. Really cool! 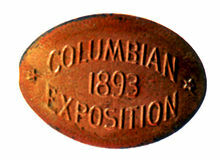 I did a little research and the first smashed penny was done in 1893 for the Columbia Exposition in Chicago. 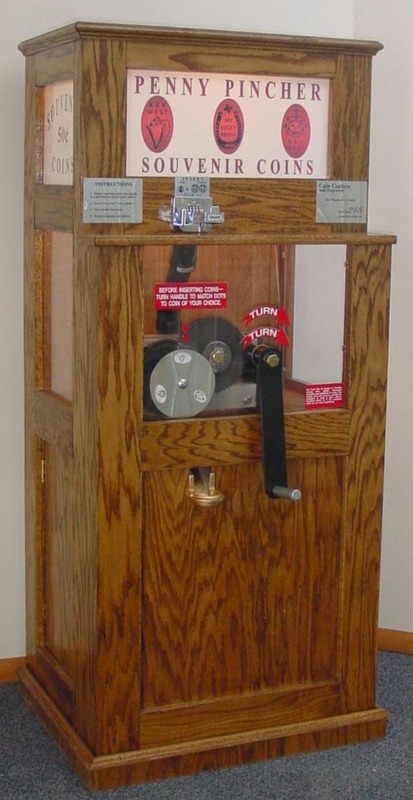 Today, most machines look like this. 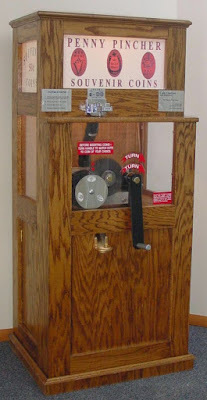 I like this kind as I can crank the wheel and watch the operation. Some machines just pump them out and you don't do anything. 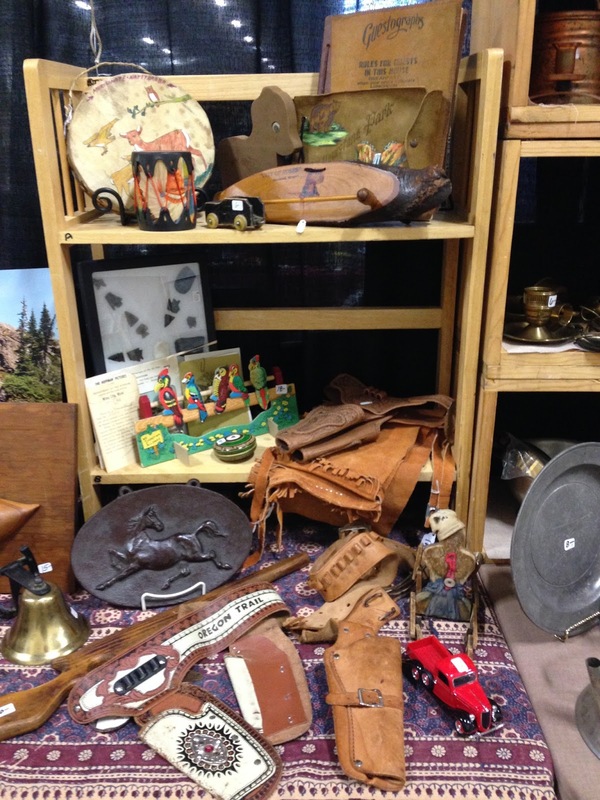 You can find them at museums, historical places, souvenir shoppes and amusement parks. As with all collecting, it gets detailed. If you are interested in more information, there's a lot of information on the internet. One last bit of information. If you have an iPhone, there is an app to find locations to get smashed pennies! It's called PENNY FINDER. I did download it on my phone for fun. It will give you local locations, locations by states and even international locations. FUN FUN FUN!